The Union government on Tuesday decided to offer the private sector bigger oil and gas areas that belong to its companies Oil and Natural Gas Corporation and Oil India on relaxed conditions. “To enhance production from existing nomination fields of ONGC and OIL, enhanced production profile will be prepared by both PSUs. For production enhancement, bringing new technology, and capital, national oil companies will be allowed to induct private sector partners,” said a government press release. Some 56 smaller contract areas of ONGC and OIL have been bid out to companies under the two rounds of discovered small fields over the last few years. 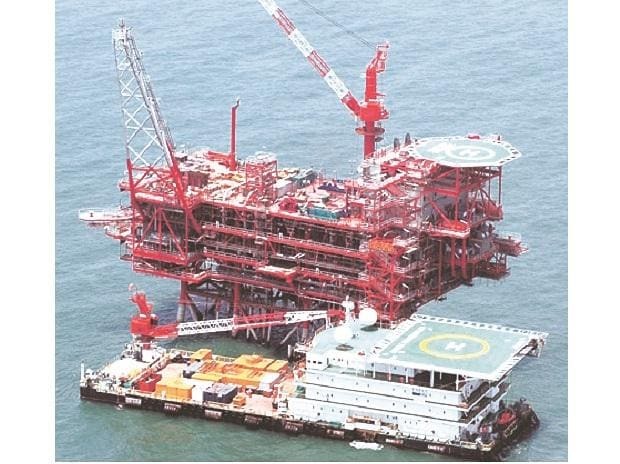 Though Union Finance Minister Arun Jaitley did not give details of the blocks to be auctioned, a senior government official said ONGC and OIL would conduct the bidding themselves. “Some 97 blocks were initially identified, but the final number could be around 64-65,” he said. To incentivise enhanced gas production, marketing and pricing freedom has been granted for those new gas discoveries where field development plan (FDP) is yet to be approved. This would mean that the notified gas price and ceiling that is set by the ministry of petroleum every six months based on a pre-set formula would not be applicable to production from these fields. The exemption was earlier applicable to only “new discoveries”. Jaitley said the terms have been recommended by a Niti Aayog panel. The government think tank’s CEO, Amitabh Kant, headed the committee to recommend steps for enhancing domestic production. Union Petroleum Minister Dharmendra Pradhan was not present in the Cabinet meeting that approved the new policy. Jaitely said for areas, which produced oil and gas, but where further exploration is required, bidders would be selected based on 70 per cent weight to work programme or the investment that these companies would put in, while 30 per cent would be for revenue share to the government. 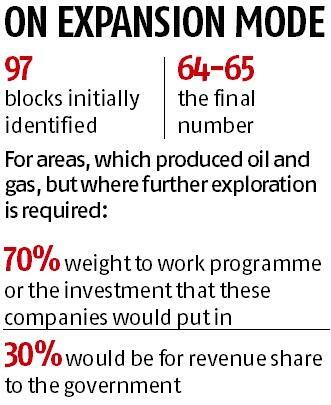 In basins where no commercial production was there, exploration blocks would be bid out exclusively on the basis of exploration work programme without any revenue or production share to the government. Royalty and statutory levies, however, will be paid by the contractor. There will be no revenue share but the winning bidder would have to partake part of its “windfall” gains, said Jaitley. An upper ceiling on revenue share, for which bids can be made, has also been prescribed to prevent unviable bidding. The policy also provides for shorter exploration period and fiscal incentive for commencement of early production. The contractor will have full marketing and pricing freedom for crude oil and natural gas to be sold at arm’s length basis through transparent and competitive bidding process, said the release. Fiscal incentive is also provided on additional gas production from domestic fields over and above normal production. Measures, such as a coordination mechanism and simplification of approval of DGH, alternate dispute resolution mechanism, etc, have also been approved. “The objective of the policy is to attract new investment in Exploration and Production (E&P) Sector, intensification of exploration activities in hitherto unexplored areas and liberalising the policy in producing basins,” said the release.